Embracing death is the key to life. Embracing your circumstances is not surrender, it is overcoming. The battle within almost every human being is the battle of circumstances. It is the source of almost all fear and all anxiety. Your life is a journey. How will you journey? Will the majority of your journey be taken up with the fear of what is going to happen? If you get caught up in the swamp of despair and anxiety then you have lost your ability to live an abundant life. 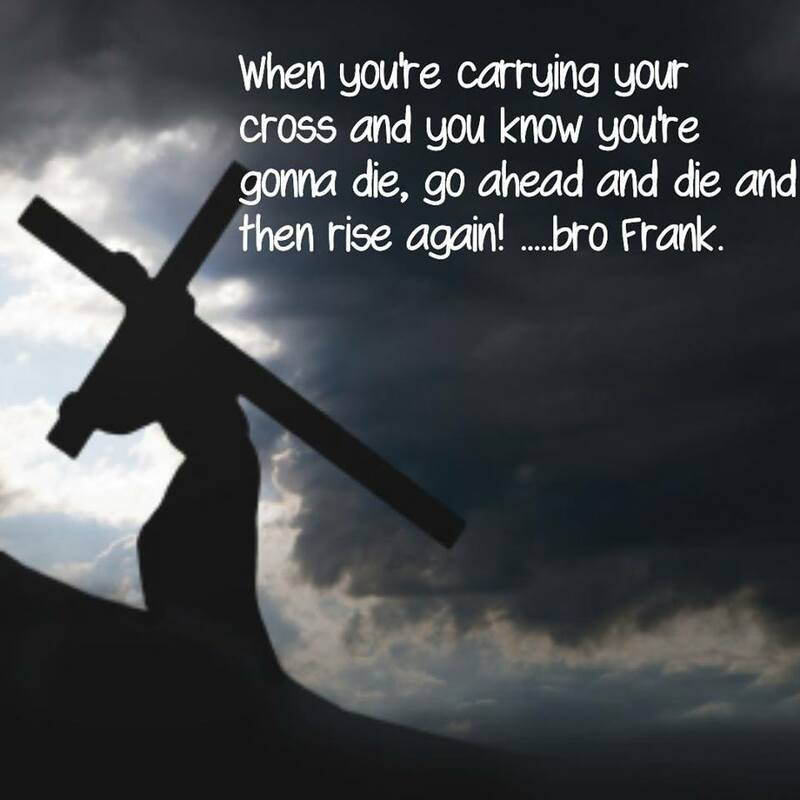 But Frank, I have cancer and I only have six months left to live. Question, will you spend your last six months on this earth in the swamp of despair? Will it change your circumstances? I have a theory. There is life in surrender. But Frank, you said that embracing your circumstances is not surrender but that it is overcoming. Yes indeed, but there is two kinds of surrender. The first surrender is the surrender of the world and it could also be known as the swamp of despair and hopelessness. In this place there is only death. The second kind of surrender is the surrender to God. Oh brothers and sisters this could not be more different from the surrender of the world. This surrender is the entrance to His rest. A place where you have laid down your burdens. A place where you walk in peace, a peace that surpasses all understanding. In this place circumstances are merely vehicles to draw you even closer to God. In the other place circumstances are vehicles for drawing you away from God. What world do you live in brothers and sisters? Remember, you cannot have a foot in one world and a foot in the other, if you do you will love one and reject the other. I believe God is calling you to step from one world, this world, with all of its cares and anxieties and circumstances, into the other world where those very circumstances are robbed of all of their death and are infused with the light of life. There is no escaping the circumstances of this life, there is only surrender. Which surrender will you choose? The one that leads to despair and hopelessness or the one that leads to life and that more abundantly. 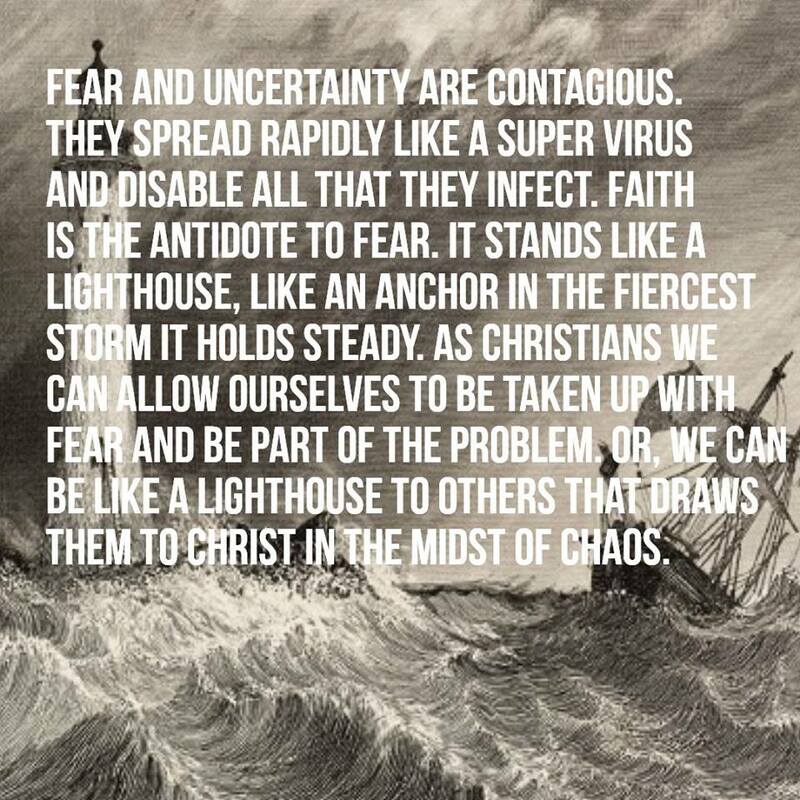 Faith is the antidote to fear! For He is with me everywhere I go. America and its place in the world. America is a country that struggles with the notion of being Christian. But in truth, there are no, nor ever have been Christians nations. In the end all nations are secular. Yet nations can be influenced by the majority culture. This influence can be for good or for ill. If the culture is predominantly Christian in nature even if not in actuality, it will still be a force for good in the world. It will still be a secular entity but will be somewhat restrained by its Christian influence. As that influence wains, then so does the actions that are taken simply because it is ” the right thing to do.” In the last administration we saw a radical departure from the Christian influence. The terrible situation in Syria was one example of expediency of a secular country and leadership devoid of Christian influence. Imagine if you will that some radical Muslim country was the superpower of today. Imagine if Russia or China was the superpower of the day. To imagine that is to imagine a truly dark world. The world takes for granted the goodness of a superpower that is influenced by a majority Christian culture. As the Christian influence wains in the highest corridors of power in America then the world becomes a darker place. For in the end the true Christian will do what is right and not what is expedient. When that aspect of influence is lost to America then the world will be lost to true darkness. In the last unholy administration that was an enemy to all things Christian, we saw how that darkness effected the world. I am not arguing for more Christian leadership in politics. My observations are of a Christian culture in decline and what effects that has on a secular world. As the world seems intent on ridding itself of any vestige of Christian influence, it cannot at the very same time mourn the coming darkness of mankind. Only in Christ is there light, all other roads lead to darkness.